Our swift response will limit further damage and prevent mold growth in your Voorhees home after a water damage disaster. Our skilled professionals are standing by 24/7 and are Faster to Any Size Disaster! 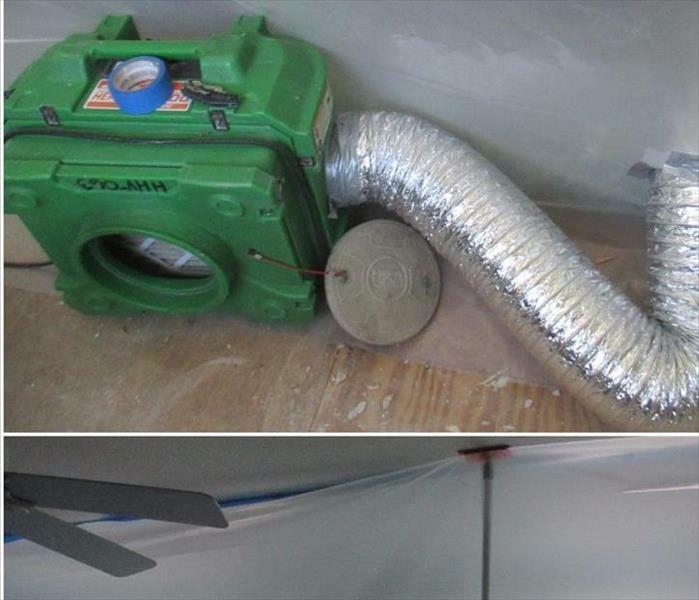 SERVPRO of Haddon Heights / Voorhees has the training, state-of-the-art equipment, and expertise to restore your Voorhees home to pre-damage condition. 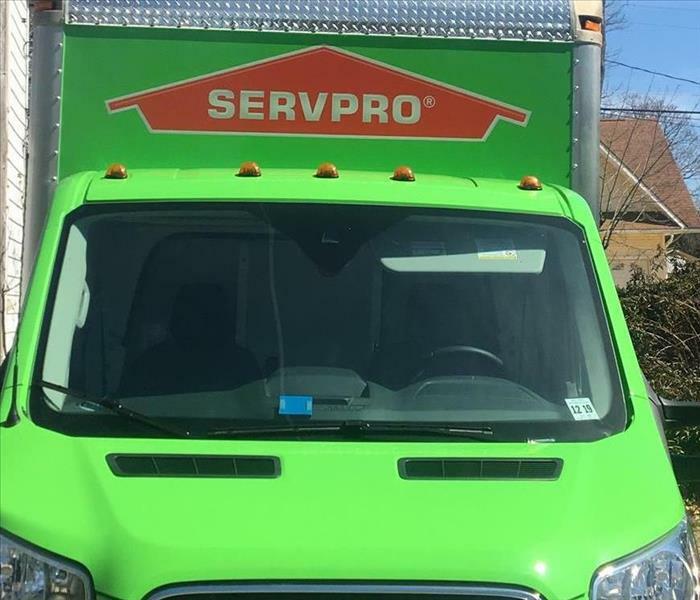 :SERVPRO of Haddon Heights/Voorhees We have expanded our fleet so that we can respond more quickly to your restoration emergency. We respond 24/7/365 to your fire, water, and mold damage cleanup needs." SERVPRO of Haddon Heights/Voorhees is here in your community and Here to Help®. Imagine coming home from vacation to find this mess. While this Haddon Heights, NJ home owners were away a pipe on the 2nd floor failed. They called SERVPRO of Haddon Heights/Voorhees and we were fast to respond and get the clean up started. When a pipe broke in the this Pennsauken NJ kitchen ceiling the home owner called SERVPRO of Haddon Heights/Voorhees. We responded right away. We were able to dry out the home with minimal disruption of the home. the customer was very satisfied. They thought we were "Neat and clean". A hot water caused damage to this Marlton, Nj kitchen. SERVPRO of Haddon Heights/Voorhees was contacted to mitigate the damage and then put the kitchen back together. SERVPRO "Like it never even happened.®"
When strong winds with accompanying rain caused damage to the roof of of this Mt. Laurel home water came through the ceiling. SERVPRO of Haddon Heights/Voorhees was contacted to clean up the damage. First we had to tarp the roof to prevent additional damage. Fire investigators suspect arson is the cause of loss at this vacant Somerdale condo. They suspect someone broke into the unit and started the fire. A motive was not known. SERVPRO of Haddon Heights/Voorhees was contacted and we started the process of putting the unit owner on the road to recovery. 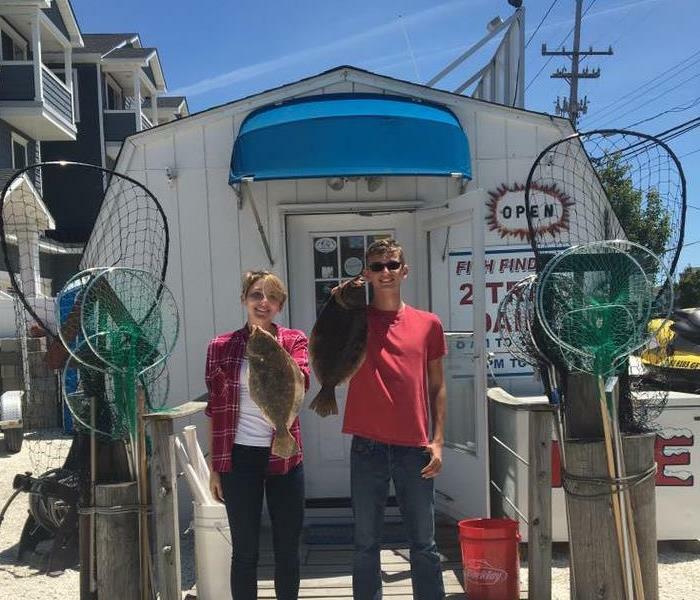 On Saturday some of the employees and their families got together for a fishing trip. Our team sacrifices a great deal of time to service our customers 24/7. It is nice when they get a chance to gather together for some fun activities. A recent round of thunderstorms damaged this roof causing water intrusion into this home in Berlin, NJ. SERVPRO of Haddon Heights/Voorhees was called to tarp the roof and mitigate the damages to the interior of the home. After significant storms it is always a good idea to take a look around your property and check for branches on the house, or any missing shingles. When mold was discovered in this Voorhees, NJ office the damaged area was isolated to allow the business to stay open. when is comes to your business keeping the operation up and running is just as important as mitigating the damage. We had to erect two separate containment barriers at this business to isolate the work area in this commercial property in Atco, NJ. If you see mold growth at your home of business contact SERVPRO of Haddon Heights/Voorhees @856-566-3388 to schedule an inspection. It is always great to get positive feedback from a satisfied customer. 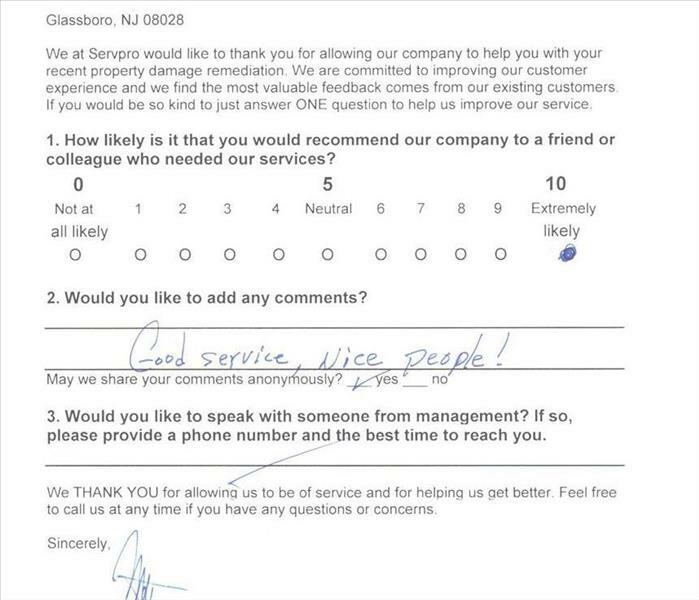 At SERVPRO of Haddon Heights/Voorhees we survey all of our customer and have a Net Promoter Score of over 90 which is outstanding. At SERVPRO of Haddon Heights/Voorhees we work hard and sometimes we need to stop and play. Our team spent the afternoon together throwing axes. We had lots of fun and laughs. It's nice to be able to help people recover from events such as house fires. 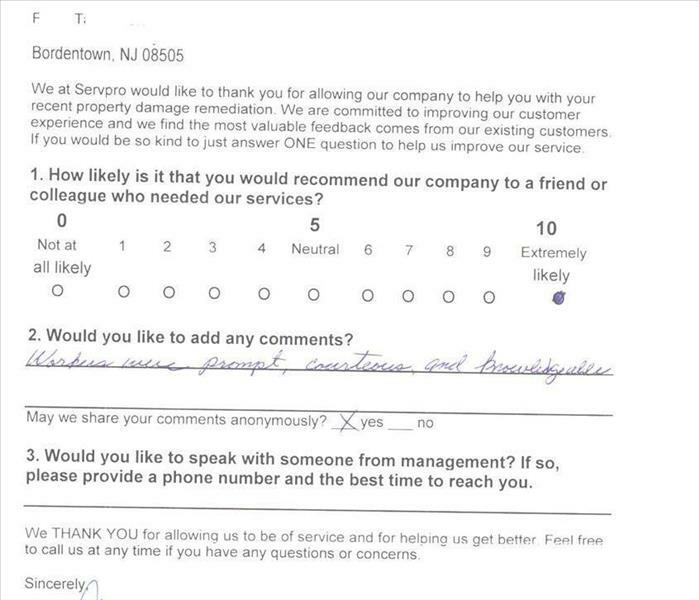 A resident of Cherry Hill writes, "I would like to thank all the employees that helped put my home back in order. Special thanks to Matt the asst. manager for being so attentive and such a nice person.". 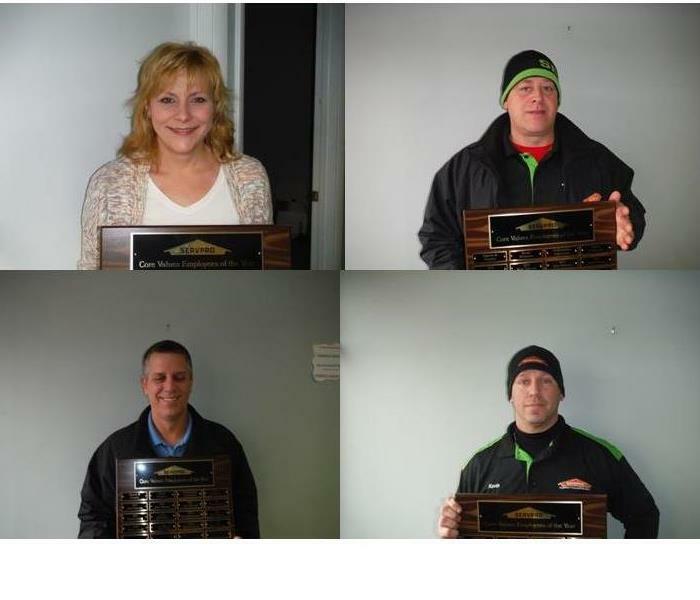 Another day, another victory for the SERVPRO team! When a tough storm meets a damaged roof, you've got a recipe for disaster. This commercial building in Somerdale saw first-hand when a recent storm left puddles of water seeping through the ceiling. When the storm cleared and all was said and done, SERVPRO was there to restore their business to normal. This warehouse for a local commercial business was infested with mold, making this area a health hazard to everyone working in it. Luckily, SERVPRO of Haddon Heights/Voorhees got this business back to being a safe and healthy work environment in no time. Mold damage is not something to take lightly and should be remedied as soon as it is spotted. Disaster can strike at a moments notice. That's why SERVPRO of Haddon Heights/Voorhees is here to make it "Like it never even happened". When a storm hits your area and a tree hits your house, we'll be there to help restore your home quickly and get you back on track. After severe water damage and flooding, this commercial warehouse space was in complete disarray. Luckily, SERVPRO of Haddon Heights/Voorhees was on the job quick to make sure that it restored to the condition it was in before the loss. Our crew's ability to get this giant room restored fast and efficiently shows that SERVPRO really is "Faster to any size disaster". 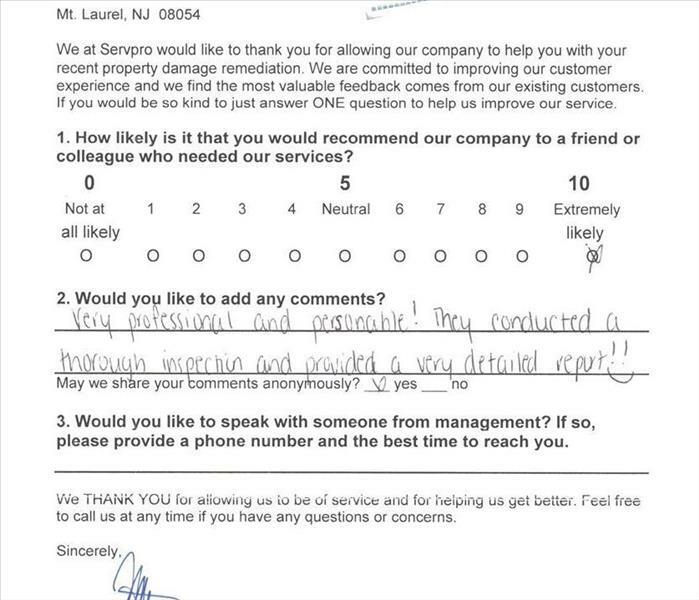 At SERVPRO we consistently get positive feedback from our customers. We love the kind words. We take great pride in our high level of services provided everyday. This basement fire in Vorhees started after a faulty electrical cord to the washing machine sparked and ignited. Thankfully no one was injured. Always be sure to check electrical wiring for any flaws, such as fraying or wear, as this can lead to an electrical fire. Call SERVPRO of Haddon Heights/Vorhees for fire restoration services at 856-566-3388. "Like it never even happened." 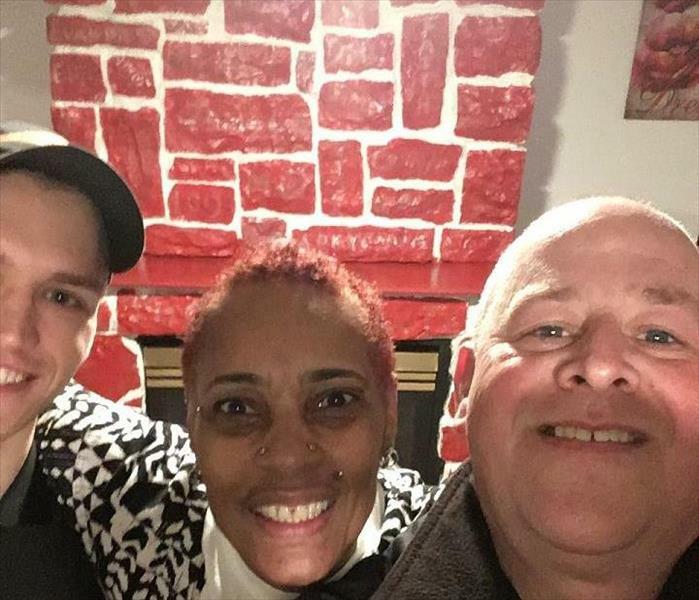 Janet G. of Moorestown posed for a selfie with our on-site supervisor, John, after he and his team from SERVPRO of Haddon Heights/Vorhees got to work restoring her kitchen counter following a pipe break. Another happy customer! 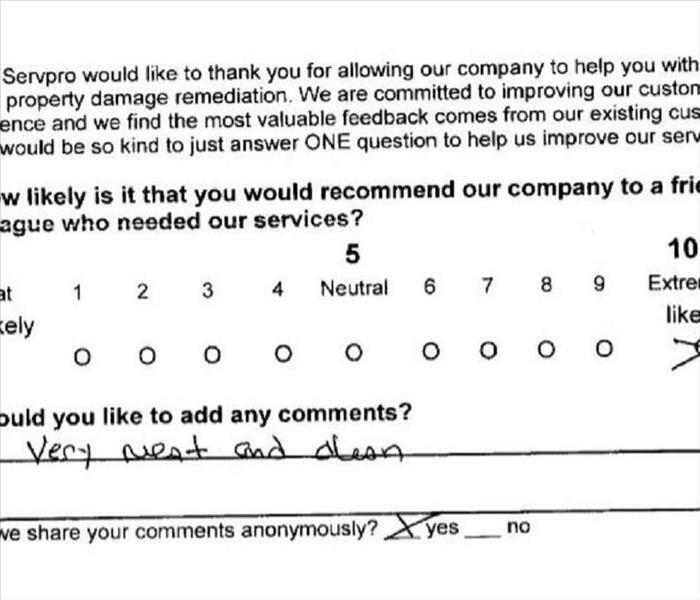 Wayne from Westmont, NJ shared the following comments after SERVPRO assisted with a water damage. "Excellent service, quick clean and professional. Employees were also extremely accommodating and friendly!" 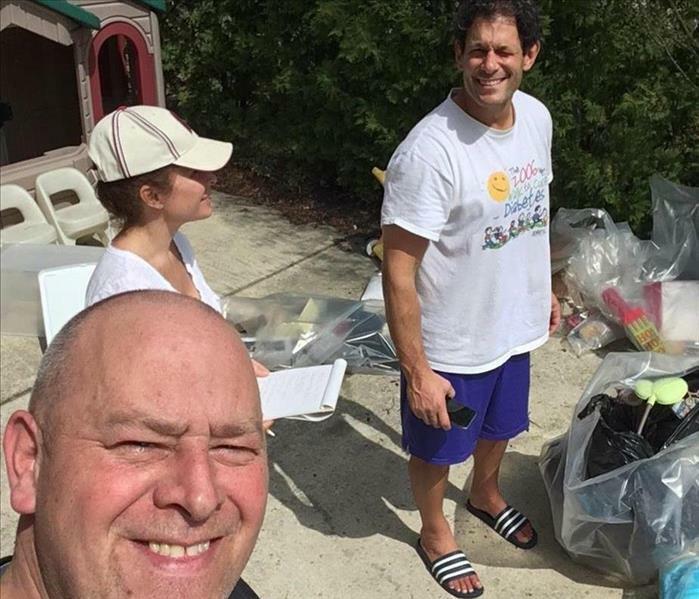 Micheal S. from Cherry Hill, NJ was so happy with our response time and outstanding customer care he and is wife got in a selfie with our on-site supervisor. Two Legs or Four, All of our Customers Love us! As you can see our services extends beyond just the job at hand. We make sure everyone in the house, including your four legged friends, are safe and happy. The toilet tank overflowed on the 1st floor and created quite a mess in the basement. 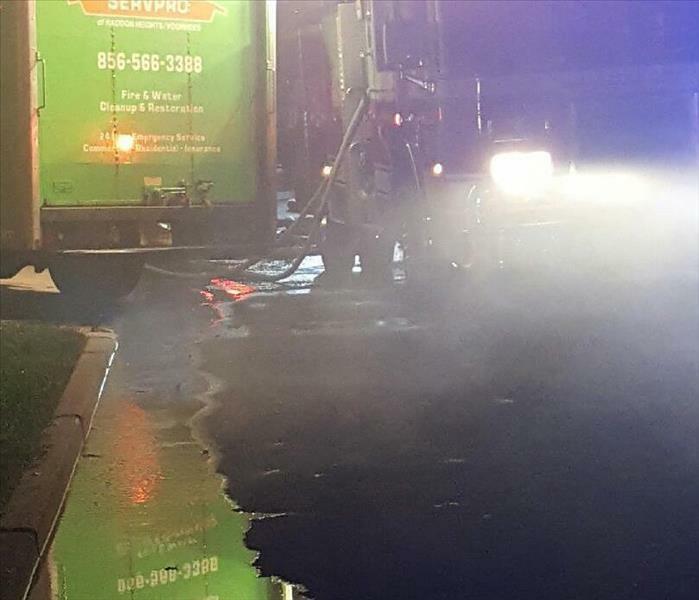 SERVPRO of Haddon Heights/Voorhess was able to respond quickly and begin the cleanup process. Timely response is critical when your home or business experiences water intrusion. Within the first 24 hours the following things can happen. When we inspected this home in Audubon NJ there were only a few stains on the ceiling caused by a roof leak. Further investigation revealed significant mold growth requiring additional precautions be taken. Every mold infestation is different, from the extent and type of growth, to the variety of materials affected. Each scenario requires a unique solution. When you discover mold, call SERVPRO of Haddon Heights/Voorhees at 856-566-3388 and we will be glad to inspect the affected area and make recommendations. Don't hesitate, call now. The mold issue will not go away on its own. When a pipe flooded several apartments in Voorhees we responded quickly. Many of the units had to remain occupied by senior citizens as they had no where else to go. We were able to dry most of the units with little or no disturbance to the residents. Flooding and water damage is very invasive. Water quickly spreads throughout your home and gets absorbed into floors, walls, furniture, and more. SERVPRO of Haddon Heights/Voorhees arrives quickly and starts the water extraction process almost immediately. This immediate response helps to minimize the damage and the cleaning and restoration costs. At SERVPRO of Haddon Heights/Voorhees our Core Values are: Dignity and Respect, Keep Promises, Professional Impression, Solve Problems. Every year the employees vote for the co-worker who most exemplifies each of the core values. The individual with the most votes has their name added to the plaque for that year as well as receiving a gift from the company. Congratulations and thanks to all of our employees who bring our core values to life every day. Rachel B. in Trenton NJ had water and mold damage affected her entire basement. We took care of the entire job: clean-up and mold remediation, drying, re-construction and then we moved her belongings back. She was so happy with how we treated her she wanted to take a selfie with a few of the guys from the crew. We become very close to our customers during there time of need. It is always great seeing them get their lives back in order. 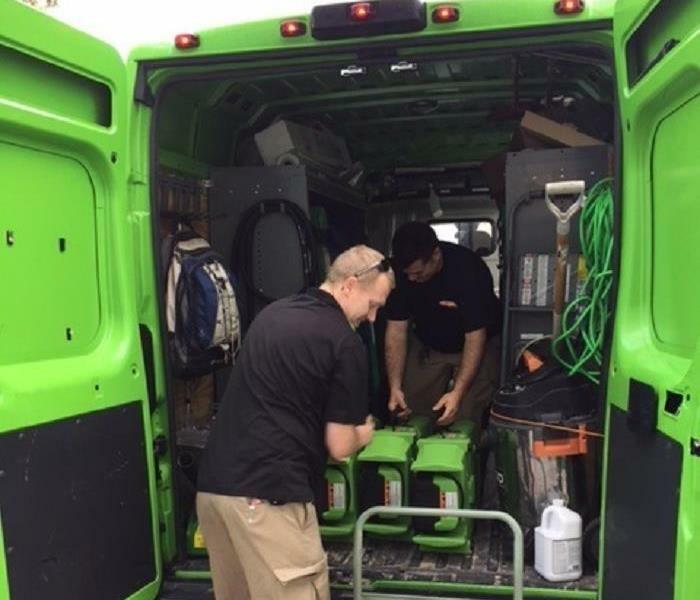 SERVPRO of Haddon Heights/Voorhees specializes in the cleanup and restoration of commercial and residential property after a water damage event. Our staff is highly trained in property damage restoration. 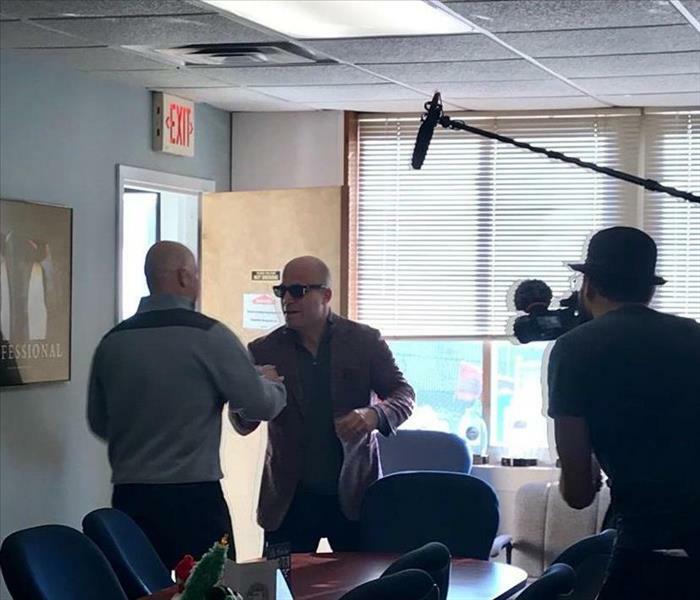 From initial and ongoing training at SERVPRO’s corporate training facility to regular IICRC-industry certification, rest assured our staff is equipped with the knowledge to restore your property and get you back to business. Small setback? Colossal catastrophe? Or something in between? We clean them all. SERVPRO® is faster to any size disaster. Crew loading up to make it "Like it never even happened." Big or small, call SERVPRO of Haddon Heights/Voorhees for all of your Fire, Water or Mold property restoration needs. Thankfully a fire extinguisher prevented this fire from creating additional damage to the kitchen. There still is quite a mess that needs to be cleaned up. We needed to install HEPA filtered air scrubber to removal airborne particles. We then HEPA vacuumed all surfaces and contents throughout the affected areas. Keeping a fire extinguisher handy can prevent significant damage. Make sure you have one in the kitchen and let every memeber of the family know where it is. This was the aftermath of a bathroom fire in Voorhees when we arrived on the scene. There was significant smoke and soot damage. We were able to provide full service Fire Restoration and move the owner back to a completely redone bathroom a few months later. We make disasters "Like it never even happened." Severe thunderstorms created minor flooding. The wood laminate flooring buckles as a result of significant water intrusion. The contents and sheetrock were able to be dried and salvaged. This room was left wet for over a week. With the humidity out of control mold began to grow everywhere. Our customer in Swedesboro had water damage as a result of a failed hot water heater. We arrived quickly, removed the water, and mitigated the damages. We are proud to be told that we are professional in our work and with our advanced equipment. We love feedback from our customers. 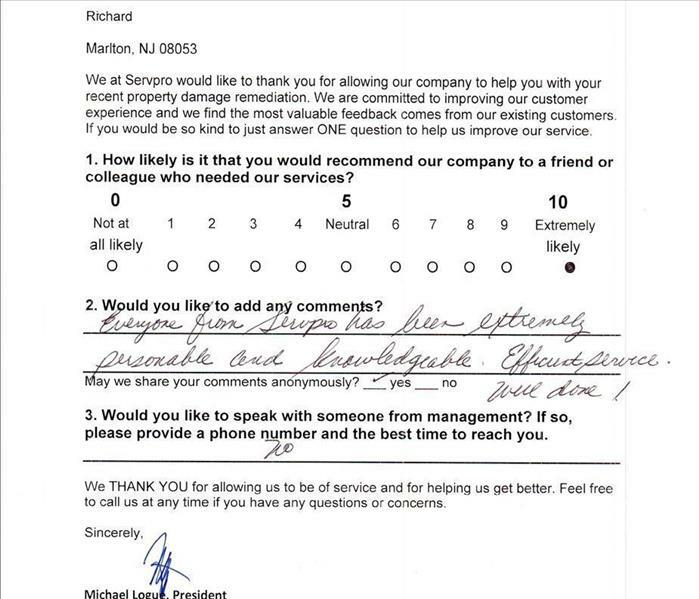 Reviews like this one from an individual from Glassboro a homeowner who had pipes leaking in her ceiling is validation that we are taking care of customers everyday. Wea rrived on site to this smoke damage loss in Voorhees, NJ prior to the fire department left the scene. 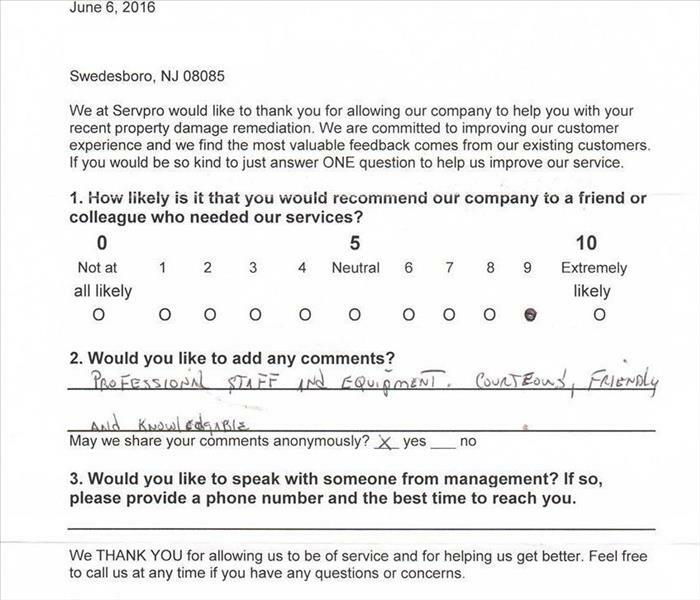 SERVPRO of Haddon Heights/Voorhees - "Faster to Any Size Disaster"
We recently assisted a customer in Bordentown NJ who had experienced a water damage at their home. 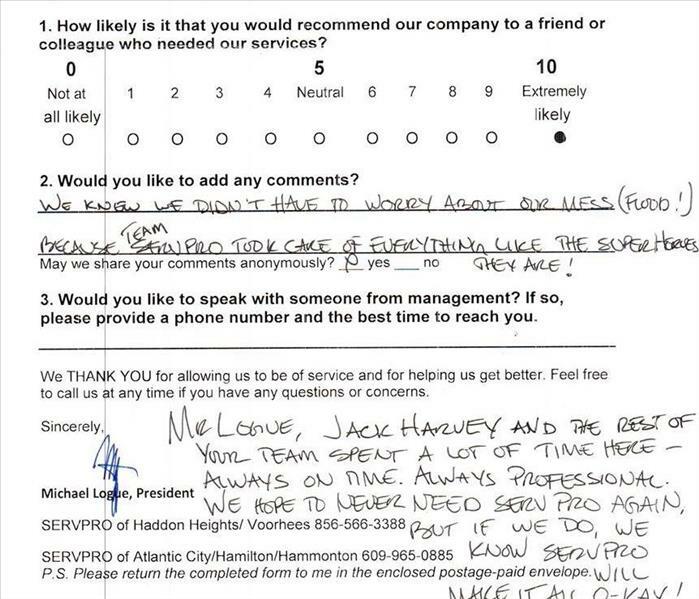 They were quite satisfied with the service we provided, and shared some kind words about our crew. We were able to assist a commercial property manager in Mt. Laurel with some mold concerns. For a no cost, no commitment Mold Inspection please call SERVPRO of Haddon Heights/Voorhees @ 856-566-3388.